Rockman Corner: Runny Nose? Rush Has Your Back! Runny Nose? Rush Has Your Back! Here's another quirky product from Capcom Japan: a plush Rush tissue box! 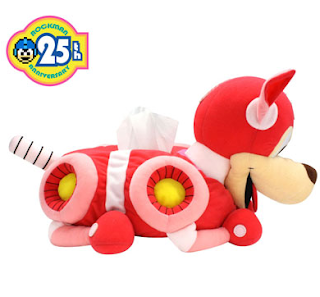 Just in time for those pre-autumn allergies, E-Capcom will be shipping this puppy out in September for 4800 Yen (roughly $47.40). With that price you'd expect it to actually jet across the room to tend to every sneeze. Nope! Still kinda cute, though. Dry tears for cancelled megaman games. Oh yaaaa 25th anniversary merchandise coming out like 3 months before it's the 26th anniversary... Geezuz they really had nothing planned now when you look at it all. $47 for a tissue box......really? I love it. I totally want one. Maybe price will drop when they hit Yahoo Japan auctions. I like Rush, and this makes this kind of want... But that is a lot of money for something like that, even if it is a plush tissue holder.